Lowdown: A subtle search for the meaning of a male adult's life. Jim Jarmusch has directed some weird stuff in his career. In general, I find his stuff interesting but overall too weird for me to like, with Ghost Dog being the exception - a truly good film. 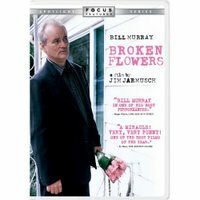 So when Broken Flowers came out I really wanted to see it with all the rave reviews it got. Alas, circumstances meant I had to wait for the DVD. Bill Murray does a turbo performance on what he gave in Lost in Translation to portray a grown up guy who has lost all appetite for living and who is living in complete apathy, living on his own at the later stages of his life without ever marrying or having kids. Although he has a reputation for being "successful with women", his girlfriend has just left him and he's stuck in total misery. Then he receives this anonymous letter written by one of his ex-women, telling him that he is the father of a 20 year old boy who is now on a quest to find his dad. With the aid of his intrusive neighbor, Murray sets out on a journey to find the mother of his child and thus find his child and thus find some meaning to his life. He makes a list of the five girlfriends matching the letter's timelines, and then sets out to track the women in his life. On his journey he starts noticing things he didn't notice before. Looking for the mother and for his life, he suddenly notices women and boys in a way he never did before. The core of the film lies with Murray's encounters with his "ex-wives", each of which ended up differently, reflecting how the collection of subtle, seemingly random events (normally referred to as "luck") can have such a huge effect on the way our lives progress. Murray's quest for a meaning ends the only way such a quest can truly end without providing the audience with a silly magical answer to all of life's woes (ala religion). 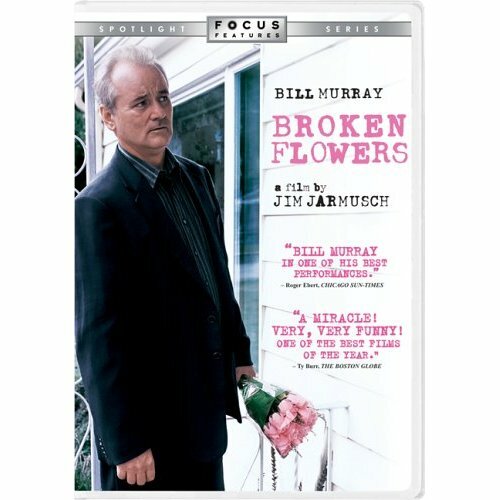 Overall, the film is an effort in subtleness; everything about it, and mainly Murray's portrayal of the lead character, is an effort in subtleness. It works out fine and the film is pretty interesting, but it's this subtleness that is also the main culprit that means the film never really soars up high to truly stir you. Despite all the excellent performances, the film misses by a narrow margin, but it still misses. I do suspect, however, that my disappointment has a lot to do with my expectations, and that Jarmusch fans as well as those of really really liked Lost in Translation will have a bit of an argument with me. Best scene: Each of the encounters with the ex-wives is truly interesting. I liked the second encounter, which was with a married woman who obviously was not in full synch with her husband. The couple was the ultimate Australian couple in their ventures: they were into pre-fab designer homes, which would mean they would go well with Australia's investment property epidemic. The wife was fantasizing about going into bottled water, which she suspects is about to become more precious than oil; I don't know if she checked it, but bottled water sells much more than gas. Anyway, a very good scene of sarcasm and tension. Picture quality: Quite bad. Not enough details, lots of noise, colors all lacking definition. Sound quality: An exercise in subtlety, I guess. The music soundtrack is quite good and provides most of the ambience, but not a lot of it. Sound effects are spread all over but dialog is locked to the center channel. Overall, it's simply not enough, although it goes with the image the film is trying to convey. Overall: 3.5 stars that could have been much more. Just reviewed this movie on theymightbecritics.blogspot.com, and I pretty much agree with you. however, I had a hard time seeing Murray's performance as "great," since I feel like his character is what brought the movie down. Can an actor play apathy well? I suppose. But maybe I just can't see it. Also, do you think the film would have been better or worse if there'd been an "answer" at the end? To me, it was completely dissatisfying as it was, and made me wonder why Jarmusch even bothered. First, I don't think that Murray's performance was great. I think it was extreme, as in how much "apathy" (for the lack of a better word) can be projected by an actor over two hours or so, but I wouldn't call it great. It wasn't even original, as it is pretty much what he did in Lost in Translation. With regards to the ending: I thought it was pretty good, in the sense that it left me wondering. If there was an answer there at the end, we would have probably filed the film as "yet another story retold"; but the lack of certainty leaves us thinking. It's a typical Jarmusch thing, and with regards to the main question the film poses - "what would have happened if" - it's probably the only answer one could get, since barring the ability to visit a parallel universe we will never know what would have really happened. I like your blog; I'll see you around there!